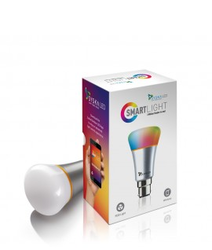 - This 7 Watt Smartlight Rainbow LED Bulb uses LED & Wireless technology to deliver infinite possibilities at your fingertips. - Download the Syska Rainbow LED Light App to experience unique features. We are amongst the most reputed names in the industry, offering Rainbow LED Bulb. We are a top notch supplier of White 7w Smart Light Rainbow LED Bulb. Our company has been successful in winning appreciation from the clients as one of the most prominent names in supply of Silver 7W Smartlight Rainbow LED Bulb. Our company has been successful in winning appreciation from the clients as one of the most prominent names in supply of Slver 7w Smart Light Rainbow Led Bulb. Banking on our We are a top-notch organization, engaged in providing Silver 7W Smartlight Rainbow LED Bulb. Download the Syska Rainbow LED Light App to experience unique features.